Small, sun dried shrimps are used as in various Thai recipes, most notably Miang Kham, Pad Thai and Green Mango with Sweet Fish Sauce. Store in the freezer for best results, then use as required after setting out for a short time to thaw. For certain recipes, you should soak in hot water for 15 minutes before using. These are the medium/large, highest quality, thus price may seem a bit high. 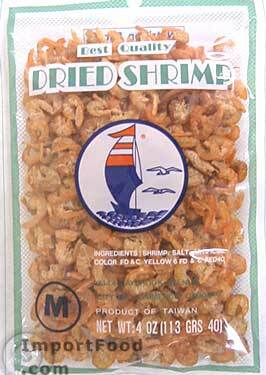 Approximately 250 large dried shrimp per 3 oz package. Ingredients: shrimp, salt, artificial color. Product of Malaysia. ImportFood.com's dried shrimp are recommended by Mark Bittman (New York Times). This recipe requires a great deal of preparation time, but it's well worth it--especially if you've eaten a tasty miang kham before and have a craving. There's nothing like it. The blend of coconut, ginger, fresh betel leaves, peanut, lime and chile is a fantastic flavor and one that goes very well with the American palate. While the easiest way to enjoy miang kham is to have it at your local Thai restaurant, it takes so much effort to make that many restaurants are not likely to offer it. ImportFood.com is a recommended supplier in Saveur Magazine.